... parties, crafts, & celebrations that are anything but ordinary! The Iron Throne- many have died because of it. Some in their quest to rule, and others from the sentences they received. Some went mad… and some probably just caught tetanus from one of its many sharp edges. In spite of the constant threat of death, you know you still want one! If not to rule over the 7 Kingdoms, then for your living room so you can rule over the TV remote. And sure, you could defeat all of your enemies and spend the next 100 days forging your own out of their melted swords, but… we may have a better idea. And if that isn’t thrilling enough, we bring to the table beer, chocolate, pretzels and peanut butter. In our scenario- you can have your throne… and eat it too! Cupcakes. Either homemade from your favorite recipe, made from a cake mix following the instructions on the box or store bought. 1 lb. of thick cut bacon. The thicker the better. Keep refrigerated until ready to use. You may even want to pop it into the freezer for a bit so it is easier to cut. A small amount of chocolate to melt and drizzle over top. We used milk chocolate Wilton baking melts. 2/3 cup smooth peanut butter. Not the natural kind that separates. Bake and cool your cupcakes. While they are cooling you can candy your bacon. Turn your oven up to 400 degrees. Line a baking sheet with aluminum foil and set a wire cooling on top. With kitchen shears or a sharp knife, cut your bacon into smaller pieces. Be sure to cut it into points. The goal is to you get rid of all the straight edges. You want to have about 3 different sizes here so that you can make the cupcakes higher in the center and then gradually shorter going out to the ends of your cupcake. Lay bacon on top of cooling rack. Make sure all of your pieces are set in from the very ends of the rack and cookie sheet. Any bacon pieces near the end or hanging over, will make a greasy mess in the bottom of your oven. While the bacon is cooking, combine the brown sugar and 1/3 cup of the beer in a small bowl. After cooking for ten minutes, remove the bacon and coat with the sugar beer mixture. There are a few ways to do this: you can brush one side with the beer then flip it over and brush the other side, or you can do what we did which was put small batches directly into the bowl of your mixture and gently stir them around until they are full coated. Return the bacon to your tray and put it back into the oven for another 10-12 minutes or until it is crisp. As the bacon cools it will get an almost glossy finish. Take your thin pretzel sticks and cut the tops into sharp edges like you did the bacon. This is a little bit harder since the pretzels are brittle and have a tendency to break while you are cutting them. We found it is best to use a serrated knife and delicately saw through the pretzels. It get easier to do once you get a feel for it. Place your pretzels aside while you make your peanut butter icing. Just like the bacon, you need a few different sizes of pretzels. To make the icing, put the butter and cream cheese into the bowl of your mixer fitted with the paddle attachment. You can also do this in a bowl using your hand mixer. Cream the butter and cream cheese until fluffy. Slowly add the powdered sugar about a cup at a time, mixing on low in between additions and going up to a higher speed once the powdered sugar is combined. Once all the sugar is combined, add your vanilla and peanut butter. Then whip for 3-5 mins. Until your frosting is fluffy. To decorate your cupcakes we suggest piping your icing on with a bag and star tip. The goal here is to have a nice, high peak in the center that will help you make the shape of your throne. You can use a butter knife instead, just remember to make a cone of icing that is higher in the middle. 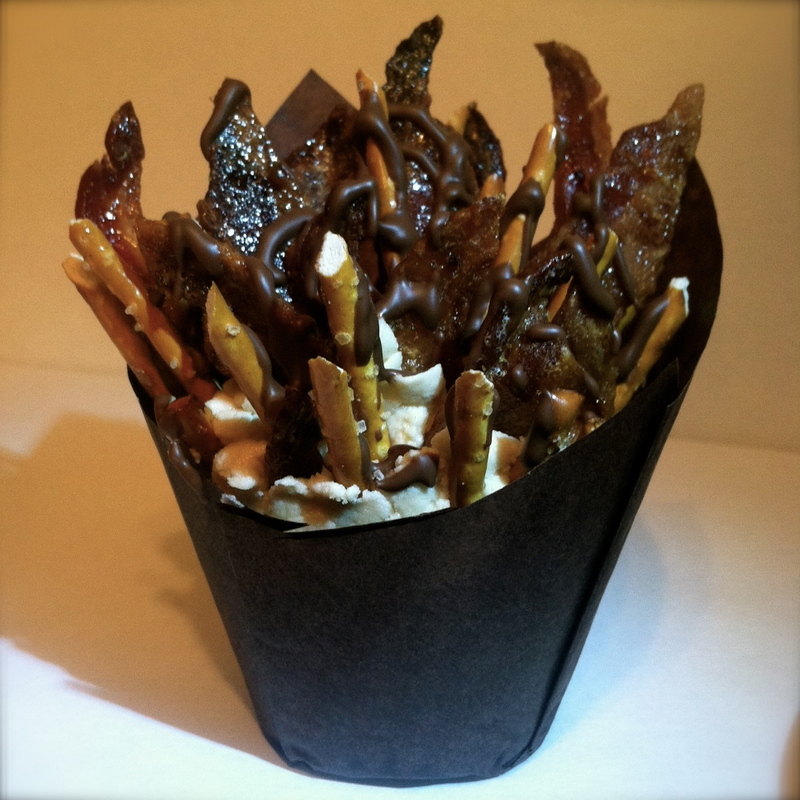 Once your cupcakes are frosted, start in the center with your tallest pieces of bacon and pretzels. Then us the medium pieces and shortest pieces as you get near the edge. Easily Entertained Tip: When you are finished sticking all of your pieces into the cupcakes put a handful of chocolate melts into a small ziplock bag. Leave the bag open a tiny bit and put it onto the microwave for about 30 seconds. Squish the pieces around in the bag with your fingers until they are smooth. If they are not fully melted you can put them back into the microwave for 10 second intervals until they are. Once they are smooth, cut a very small piece off one corner of the bag and use it like a pastry bag to drizzle chocolate over all of your thrones. 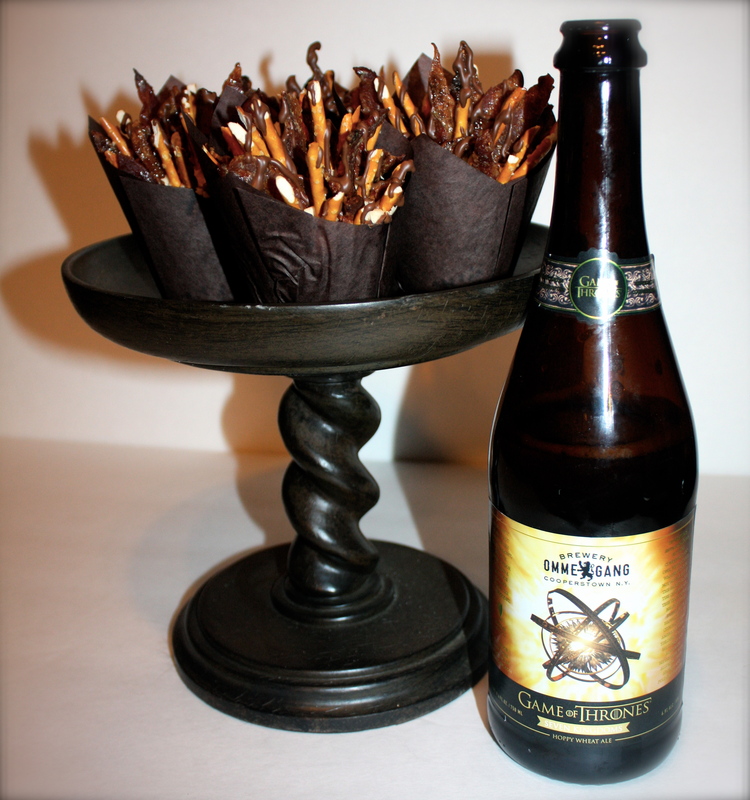 Put your finished thrones into the brown tulip cups and there you have it. Edible Iron Thrones for all! 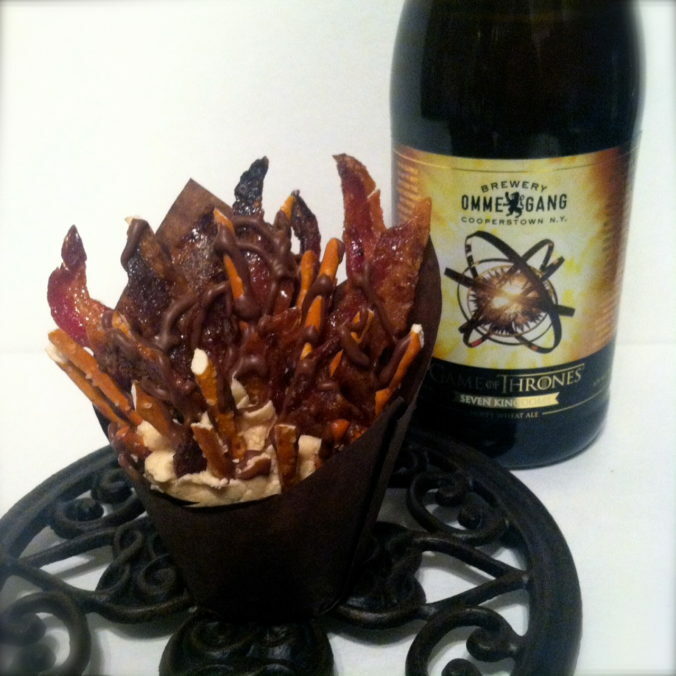 The perfect snack to enjoy while watching the new season of Game of Thrones on HBO. Have an Epic Mother’s Day! We are… three friends with a passion for cooking, crafting and turning the things we love into party themes and projects. Jessica is a twin mom, lover of superheroes and master of the Silhouette Cameo machine. Michele is a quirky baker who loves old movies, Halloween and her cat Larry. Montana is a pearl wearing, healthy-eating prepster with a little bit of edge. They all agree on one thing, that entertaining should be fun... and easy.